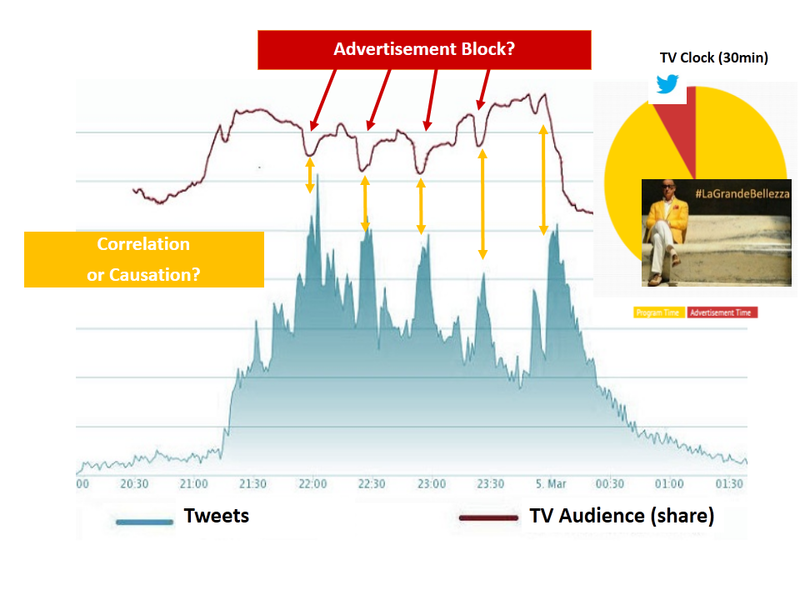 TV Audience and Tweets Flow: a great beauty or bigdata SLIP n.1 for marketing communication strategists (statistic)? After being awarded as the best foreign language movie (Italy) Academy Awards 20014, The Great Beauty, directed by Paolo Sorrentino, got an outstanding audience last week when it was broadcasted in Italy in TV prime time. Comments and opinions about the movie apart (I would recommend to see it), providing trends and flows among social medias is getting more frequent every day. Few day ago, it has been posted by the Italian TV Network that transmitted the movie, a “statistic” (here) regarding the Tweet flows with the purpose to explain when twitters’ peaks happened as well as gathering the main influencers. Accordingly to a third party analysis, twitters’ peaks happened at specific moments: 1) a meaningful sentence by Jep Gambardella, the protagonist, 2) when the Sabrina Ferilli (famous Italian actress) showed up in the movie with all her beauty and 3) at the end of the movie. Twitters’ peaks happen concurrently with a temporary decline of the TV audience (share). Thus, a correlation (negative) between peaks in Twitter and TV Share exists. The Twitters’ peaks and audiences’ downturns occur with a perfect timing: one each 30 minutes. …well, I am wondering: Is there also a cause-effect relationship between advertisements’ stops during TV programs and the peaks registered in Twitter? Who knows. An answer should be provided only analyzing data and real facts carefully. For example, why not putting chips in our home that register and transmit also when the refrigerator has been opened to bring something to eat or even when a WC has just been flushed? Other stimulating correlations might be found by gathering such kind of data. Anyhow, finding correlations it’s quite easy. Just observe what happen. Finding causation relationships is definetely much more tricky (see also BigData S.L.I.P.S. n.1: statistic) since a deep knowledge of what is going to be analyzed is required and it is quite easy to fall into wrong assumptions. In this case, the beauty of human behaviours. By the way, concerning the connection between Tweets and TV shows, last year Twitter and BBC America have established a partnership for advertising (see Mashable, Twitter Partners With BBC America to Promote Branded Videos). This entry was posted in BigData, Business World, Marketing, Science & Technology, Social Media and tagged Analytics, BigData, La Grande Bellezza, Marketing Communication, Social Media, Statistic, Twitter by ivangruer. Bookmark the permalink.